Activision Blizzard’s (NASDAQ:ATVI) Blizzard segment accounted for 30% of the company’s overall revenues in 2017, but we estimate that the segment accounts for over 50% of the company’s overall value. We believe that the Blizzard segment will account for more revenues and profits in the coming years, which will be driven by an increase in its user base. 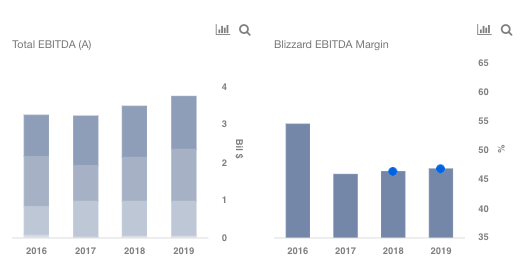 Take a look at our interactive dashboard of ATVI’s Blizzard segment, which shows how the segment will perform in the coming years, compared to the company’s other segments. 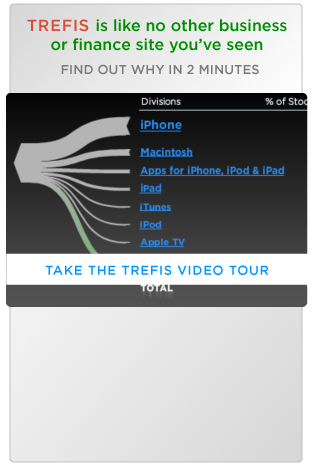 You can modify the assumptions to generate your own estimate of the company’s value. We expect the revenue contribution from Blizzard to increase from a little under 30% in 2016 to over 35% in 2019, and over 50% by the end of the Trefis forecast period in 2024. This can primarily be attributed to our forecast of a double digit growth in Blizzard’s monthly active users from 42 million in 2017 to 56 million by 2019, driven by two factors ~ 1) Strong Blizzard Lineup, and 2) Rising Popularity of E-Sports. In the past few years, most of Blizzard’s launches have been able to carve out a niche for themselves and have helped the franchise grow. The success of Overwatch is a testament to this trend. It should be noted that Overwatch was awarded the Game of the Year for 2016, and the game had over 35 million users by the end of 2017. Going forward, with Overwatch expected to grow further, and games such as World of Warcraft and Hearthstone to maintain its loyal customer base, we anticipate the segment’s monthly active users to grow at a CAGR of 15% over the next few years. In addition, the launch of the company’s Major League Gaming for its highly popular Overwatch, along with the existing league for World of Warcraft, is providing a unique platform for gamers to connect and play. With the company’s plan to strengthen its e-sports segment, we anticipate a larger audience for the company. Additionally, live streaming of the games can help generate additional advertising revenue, which should augment the overall segment revenues. Having said that, Blizzard recently faced some pressure on average revenue per active user, despite an increase in its user base. This can partly be attributed to the seasonality of games. For instance, World of Warcraft did not release any title in 2017. However, the company is expected to release Battle for Azeroth later this year. Accordingly, we expect modest growth in Blizzard Revenue Per Active User to $53 in 2019. With an increase in Blizzard’s revenue, it will also account for higher EBITDA in the coming years. We expect the segment EBITDA to grow from $950 million in 2017 to around $1.40 billion by 2019, with a 90 basis point increase in overall margins over the next two years. With the launch of digital packs, the shelf life of console games has steadily been increasing. In order to ensure freshness in the game content, the company launches regular updates of the existing games, which are essentially an extension of the game. 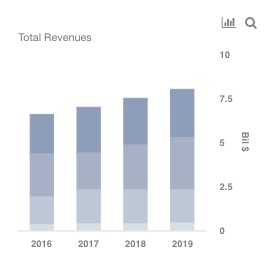 The uptick in revenues from digital packs ensures greater profitability for the company and the franchise since the costs related to the manufacturing of digital content are significantly lower in comparison to that of making a new game. Blizzard plans to launch a substantial number of digital packs for its existing franchises, which should drive its growth in the near future. However, there may be no version of Overwatch for consoles in the near future, and overall competition in the gaming industry, will keep the segment margin growth in check.